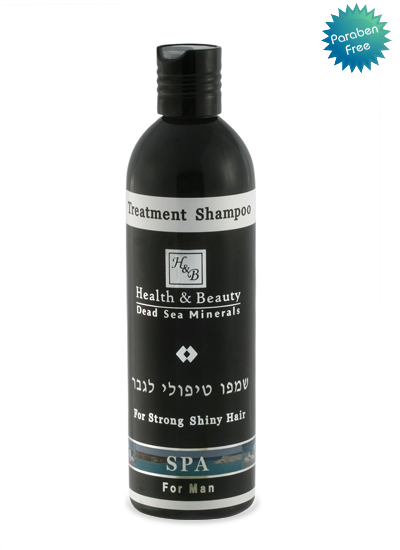 Treatment Shampoo for Strong Shiny Hair man. The hair is one of the most conspicuous aspects of our appearance and requires constant care. Sun, wind, dryness, excessive use of hair dryer, chemicals used in hair dying, exposure to sea water, stress and unbalanced lifestyle, all damage hair quality and appearance. The hair becomes thinner, dry, fragile and splitting. For these hair problems a high quality shampoo was created, which is one of the best of its kind. The shampoo contains proteins which repair hair appearance, vitamin E, pro-vitamin B5, sunscreens and Dead Sea minerals for hair regeneration, strengthening and reconstruction. The unique and rich combination of ingredients such as olive oil, honey, Argan oil, Sea Buckthorn oil, jojoba oil and grape seed oil, infiltrates the scalp skin, nurtures, regenerates and wraps the hair with a natural protective layer for a healthy, soft and flexible hair with a wonderful fragrance. The shampoo is recommended for all types of hair and for hair loss. Suitable for daily use for all ages. Use: Wash hair while massaging scalp, rinse and repeat again. Leave the shampoo for about 2 minutes and rinse well. For optimal results it is recommended to constantly use one of the hair masks and no rinse hair moisturizer of H&B.